Last weekend on our berry picking adventure, Andy and I each bought a cookie for the road as we were paying for our berries. He picked chocolate chip, and I got one called lemon burst or sunshine lemon or something equally cheery and quaint. The name was endearing, but the cookie? Oh my. I was expecting to be underwhelmed by random cookie, but it was perfect for this lemon lover. It was dotted with white chocolate chunks, and had just the right ratio of softness to crisp and sweetness to tart. In the days since, I haven't been able to stop thinking about this darn cookie, so I decided to see if I could pull it off. After poking around all corners of the internet, I chose a recipe based on lemon cake mix. I've had luck being innovative with cake mix in the past, plus this also called for lemon juice, zest, and extract, so the flavor had to me more dynamic than just a boxed mix. I was fully expecting to have to make these at least several times before finding the perfect balance of flavor and texture to mimic the cookies I've been daydreaming about. I'm happy to say that wasn't necessary, I got it right on the first try! 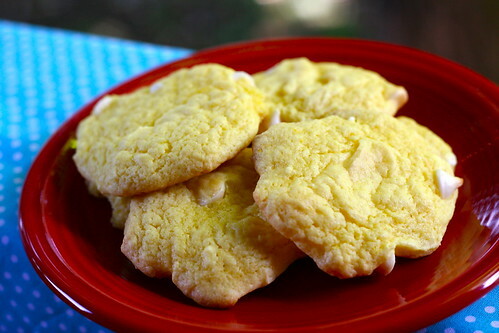 I'm calling these Sunshine Cookies since the flavor's so bright...and they're really, really yellow. These cookies are a great one-bowl, 3-minutes of prep, sure to impress dessert. 2. Pour cake mix into a large bowl. Add in the rest of the ingredients except white chocolate chips. Stir until well combined (Amy's note: I used my KitchenAid mixer, it was done in about 10 seconds). Gently stir in white chocolate chips. 3. Line cookie sheets with silicone baking mat or parchment paper. Drop by teaspoonful onto the cookie sheets (12 cookies on each sheet, bake in batches as needed). Bake for 7 minutes or until the edges are just beginning to brown. Cool for 2-3 minutes on cookie sheet, then transfer to a wire rack to cool completely. Enjoy! I just discovered how well lemon goes w/ white chocolate around Easter time. This is a great way to combine those flavors! These sound so good. I love lemon in anything, and I also love cakey cookies. yum! I LOVE Lemon. What a great idea to add in the white chocolate. I'm putting these on my have to make list :) Thanks 4 sharing. I love lemon and sunshine! Happy Summer to you! I need to save this recipe to make for my mother! I love that you call them sunshine cookies. I'm feeling so sunshine-deprived right now. This look delicious and refreshing! Those look great! I bet macadamia nuts would be good addition too! Wow I love how simple these are but the flavor combo...wow!!! I am so glad you liked these...thanks for linking back to me! Love the name you gave them!!! Oh, my. These look and sound amazing! I love lemony treats so these are definitely going on my to-try list. I love lemony stuff! I had a lemon bar from Market of Choice today. Mmmm. 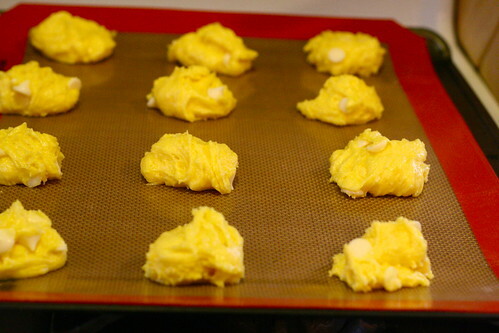 I love the use of the white chocolate chips in your cookies. In my opinion, they are totally underrated! These sound perfect! Love the idea of lemon and white chocolate chips together. Yum!